Solar cell fabric is a fabric with embedded photovoltaic (PV) cells which generate electricity when exposed to light. Scientists have been working on developing a practical solar cell textile for years, and now they are getting closer to a finalized design. 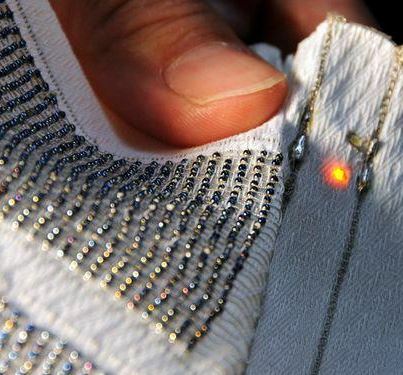 At the moment, solar cell textiles are still in the testing phase. Researchers have successfully demonstrated that the materials can produce power by integrating them into many different fabric items, including clothing, curtains and tents. These convenient, wearable electronics that use photovoltaic power aren’t on the market yet, but in the meantime, you can keep your smartphone charged up with a portable photovoltaic device. Mobile chargers can give you enough juice for one or more charges, depending upon the model. Or go a bit bigger — and have more photovoltaic power for other small electronics — with a portable solar kit. Solar cell fabric may not be available yet, but affordable residential and commercial photovoltaic systems are. Generate your own free power and exercise your energy independence by calling Intermountain Wind & Solar today. Serving customers throughout the Intermountain West, we look forward to helping you learn more about today’s cutting-edge solar technologies.